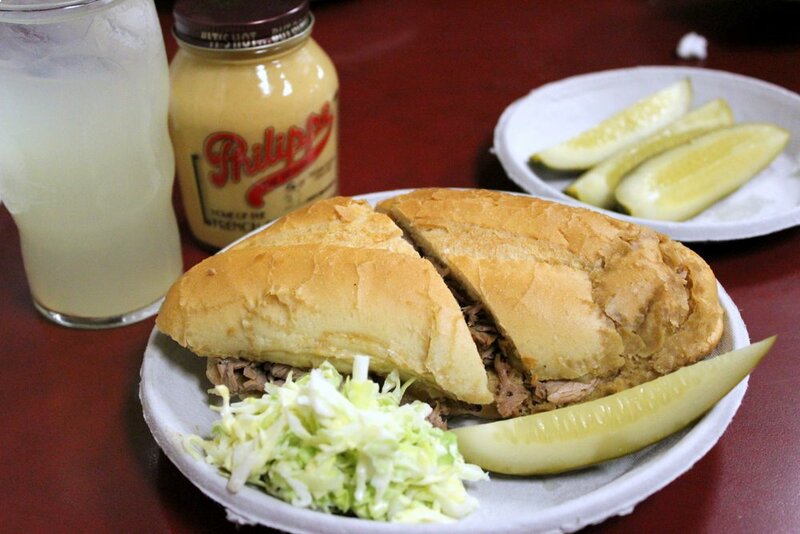 The French dip sandwich is said to have originated at Philippe, the Original, a 100+ year old deli in downtown Los Angeles. So when Jan and I found ourselves even in the remote vicinity of the place on a recent trip to Southern California, we had a pretty big item on our to-do list: eat a French dip sandwich at Philippe’s. We had seen the restaurant featured on both the Food Network and the Travel Channel, and since both Jan and I are fans of the classic roast beef sandwich dipped in au jus, we were excited. Our friend David, who we were visiting while we were in L.A., had only sampled (and loved) the spicy mustard from Philippe’s, but had never been to the restaurant, so with three people hungry for roast beef, we hopped in the car and made our way. Located in downtown Los Angeles and just at the edge of Chinatown, we were able to find a parking spot in the Philippe’s parking lot. Inside, the atmosphere was great: combination of train depot and cafeteria, with multiple lines forming in front of a large glass deli counter. Despite choices for beef, lamb, turkey, and pork sandwiches, we all ordered the same thing: the classic beef. After all, it seemed silly to come to the birthplace of the French dip sandwich to order anything else. While we waited, we read the Philippe’s brochure, which told several versions of the sandwich’s creation. My favorite tale was the one that had the sandwich invented by accident when Philippe accidentally dipped a customer’s French roll in the roasting pan still filled with juice from the oven, to which the customer said he would take the sandwich anyway. Another version had a policeman with the last name of “French” requesting his sandwich to be dipped, while still another had a fireman asking for dipped bread because he complained that the bread was dry. Regardless of which was the real story, I was anxious to try the sandwich. When we ordered, Jan made one modification to his; his sandwich was twice-dipped, while the rest were dipped in the au jus just once. Unlike some preparations of the French dip, the sandwich was dipped and served on the plate, and not with a side of the broth like I had seen at other places. Though I was initially skeptical, it worked. The bread was soft but not soggy, and the beef was flavorful without being overly salty. I tried a bite of Jan’s double-dipped sandwich, and his was soggy. The two trips into the au jus had thrown the bread over its moisture-absorbency level, we all agreed. With a simple side of coleslaw, pickle, and lemonade, the meal was no-frills but tasty (see picture at the top of this post). I sampled the famous mustard, but it was so spicy it had me sneezing. Jan and David, however, added the spicy mustard to their sandwiches. I loved the feeling that I was eating in a dining room whose décor had probably changed very little from 100 years ago. While we devoured our sandwiches, David said we had to try his favorite place for roast beef sandwiches on our next visit, the Italian version of the French dip, he said. And then we had an idea: why not try the sandwich now? We still had a little room in our bellies, and if we split the sandwich, we wouldn’t be overdoing it too much, right? Tonight would be the beef sandwich sampler, we decided, and headed out the door. David took us to Taste Chicago in Burbank, and we ordered one Italian beef sandwich and took our seats in the cozy dining area. When our sandwich was delivered to our table, I took a breath—getting ready for more beef. With different spices, and the addition of onions and peppers, the flavor of the sandwich was completely different from the beef sandwich we’d had less than an hour before. We decided we couldn’t compare the two, even though they were in fact roast beef sandwiches that had been dipped in broth, they really were too different from each other to compare. We decided instead, one would just have to choose the kind of roast beef one was in the mood for. Despite being overly stuffed with food, I was glad we got to sample two variations of the dipped beef sandwich. I could see that the bread-beef-broth combination was so universal that so much could be done with it. Our beef sandwich sampler dinner got me wanting to race home and invent my own roast beef-French dip-sandwich creation, and devise a grand story about its invention. Yum! Which one did you like more? I can’t wait to read about your own version of the French Dip. My favorite version is from Champagne French Bakery (located throughout California) – it comes with a nice big bowl of the auju!